Tailor made applications have been making their mark ahead than those traditional applications these days in the market. Since open market offering “Hire A Developer” have been so good at their own specialized areas that their market has brought the magic in! Early in those days, while your friend ventured into new business, it was difficult to search for a genuine yet professional web developer for making a website. This was one of those tough tasks which were to be taken into consideration largely. 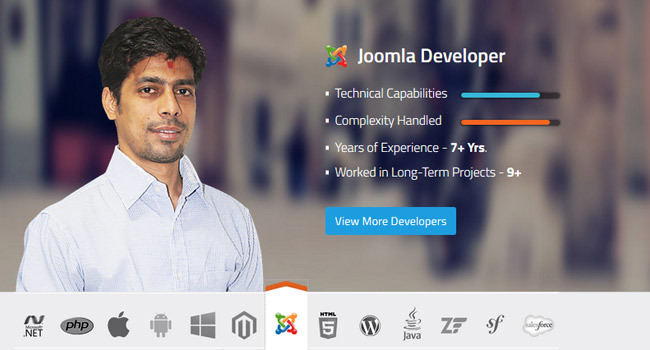 But now with the entrance of IT companies with conventional view, it has provided complete flexibility by offering option of hiring a website designer/developer for particular period of time. Fixed projects are taking their names out from the list where as a group of web developers and designers are placed instead which ensure smooth, timely and expert touch to give an extra edge to your business. There are number of web portals where skilled people display their work and you can hire them once after reviewing their work. Not only Indian companies, but also companies having their locations spread globally have this option open, where the audience has the liberty to choose the best from the array of options given and hire them on project basis. When you hire a developer, you can surely cut down on the other expenses which usually occur counting on the part of resources, man power etc. At times, it becomes implausible to get people who can really work upon your requirements in right way and produce best results. You can choose those whose work is impressive and their talent can make your dreams come true! Hire a developer term hasn’t been a pristine idea in the market, but we have been watching companies hiring full-time employees as they can then reply upon completely and track the working hours accordingly. Silver Touch Technologies Limited., being a goal-driven IT company offers solutions related to IT field to small, medium and large sized companies while delivering unparalleled value to a wide spectrum of fields existing in the market at global level. Since its inception year 1992, the company has developed its own performance measurement systems while having business development centers spread over: UK, USA, France, Australia, Sweden and Germany apart from India. Moving an extra mile in keeping our commitments towards work quality, timeliness and upgraded technical aptitude has helped to maintain long-term and healthy relationships with our clients. When you hire a developer from Silver Touch Technologies Limited., you can get the following benefits: • Full-time Dedicated Developer • Smart Development • Follow Agile Methodology • Cost-Effective • Direct Communication • Support Services Availability They help the clients to develop smart web and mobile based applications for their business whether it is huge enterprise or an up growing one! Although fix scope software projects are becoming irrelevant in today’s fast area, hire a developer option works much better while you need customization and quick delivery options. Control over complete procedures can ultimately deliver faster work, incur budgetary expenses, faster turnaround time for queries and provide support services till the end step of project execution helps you to frame a high-end working solution for your business. What can you achieve after hiring a proficient developer of Silver Touch Technologies? • Freedom of scalability • State-of-the-art Infrastructure • Huge range of Service offerings • Best Allocation of Resources • Multiple technology Experts to select from Suits in the Best When you hire a website developer or mobile developer of Silver Touch Technologies Limited., you can get rest assured as our developers analyze your business requirements, prepare a plan and then proceed towards building it after your approval. When you plan for the super amazing things to get done, it is vital to get people who are aware of nicheness and new innovations of the field. Check on the Capabilities You can personally check on the skill-set of the developer before you plan to hire him/her. This power to choose one among the already best developers would enable you to share every small requirement to the developer while you hire them on hourly, weekly or monthly basis. Advantage of Smart Features For e-Commerce online shopping portals, you can hire a developer from Silver Touch Technologies Limited. you get paramount of experienced people who can really prove very helpful in developing website, right the same as you’ve dreamt of! Summary: Silver Touch Technologies Limited. 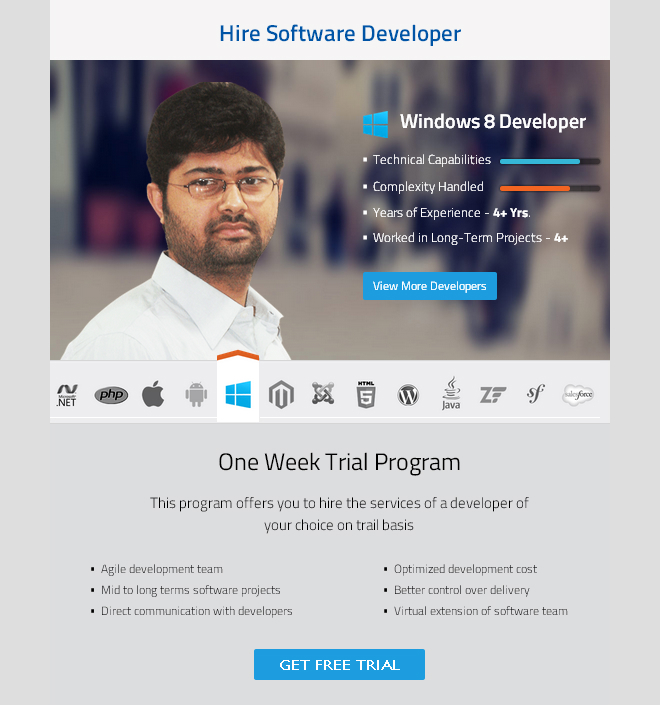 offering pilot project run free of cost when you first hire a developer from their resources. And this has been termed a must try model for enterprise clients as they have huge scaled projects to be done in the best way and with expert team. The passionate web developers of this company have years of experience in development static to complex leveled websites and being facility of dedicated virtual team for each project, we endow the clients with improved solutions within their given cost lines.